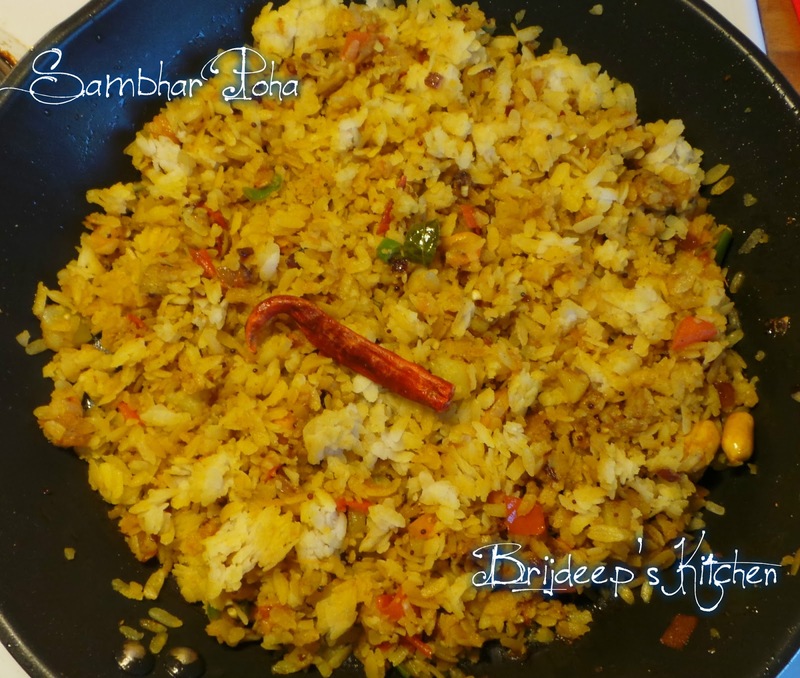 Sambhar poha? Wondering what exactly is it? Well, even I was. I had never heard the name of this dish anywhere, let alone taste it. Yes, I do love sambhar with idlis, yes I do make various kinds of poha, but well, this recipe is a fusion of both. How did it come into existence? I was talking to a dear friend one fine day and in the middle of the conversation she told me her daughter loves to eat "Sambhar Poha". What? Then she told me as her daughter loved the taste of sambhar and it was difficult for her to prepare idlis every time, she discovered this method of preparing this healthy Sambhar Poha.. I have no kids but I wanted to go ahead and try this recipe, and I totally loved it. 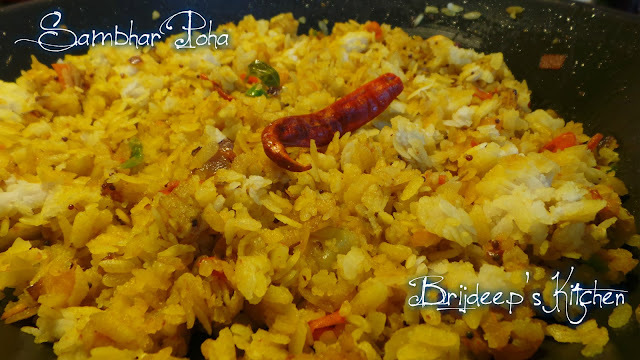 It was a new addition to my poha collection. 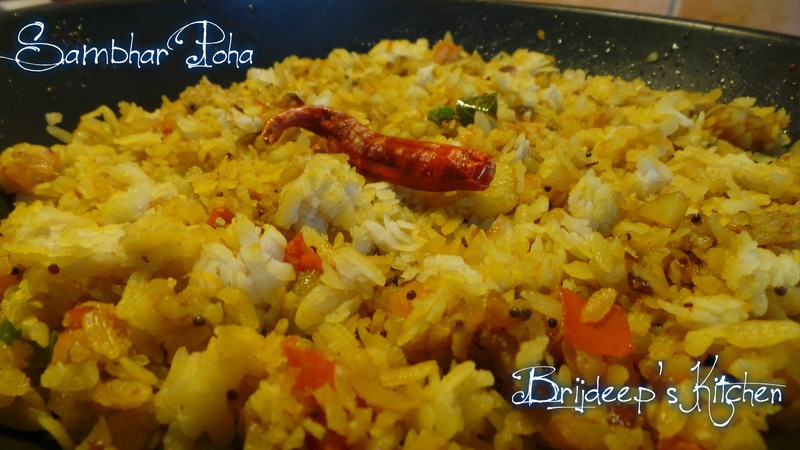 (Here's my poha collection: Poha Recipes). I skipped on to the veggies, you can skip or add as many veggies as you wish to. Run the poha under water in a colander so all the poha are wet uniformly and keep aside. Boil all the vegetables separately and keep aside. I use frozen peas so I don't need to boil them, I add directly. Also I fry the potatoes instead of boiling. This is optional. Heat oil in a pan on medium flame and crackle the mustard seeds. Add the curry leaves, peanuts (optional) and red chilli. Add the onions, let the onions cook and become transparent. Don't let them brown. Add the potatoes (if you want to fry the potatoes instead of boiling, tastes better but takes little more time) and sprinkle salt. Let cook until the potatoes are done. This step is optional. Add the tomato, green chilli and peas (if using frozen peas) and sprinkle salt (do not add salt if already added in step 4). Let cook until the tomatoes are soft. Add the chopped and boiled veggies and toss well into the masala. Add the sambhar masala and tamarind. Mix everything well so that all the veggies are coated in the masala and let cook for few minutes. Add the poha and mix everything well. Let cook for another minute and turn off the flame. Sprinkle lemon juice (optional) and serve healthy dish.